Hi. I'm back. Sorry for being away so long. Will do better going forward, promise. Just couple of small points to get this ice broken up again. First, just finished the first book of the year (though I started reading it last year). 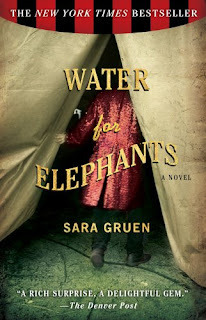 If you haven't read Water for Elephants, by Sara Gruen, put down the book you're reading (unless it's mine) head out to Borders before they go out of business and by this book. And read it. Few books I will say this about, few books set me on fire as a reader, but this one did. By far, I'd say one of the top ten books, overall - story, writing, characters, pace - I've read. Period. Now, I've read a lot of books, and enjoyed, been thrilled by, what have you, many of them. But if I was forced to write down right now a top ten list, this would be on it. Where on the list? No idea, not that it matters. Now, mind you, I've been trying to get caught up on the classics, as it were. Recently finished 1984 (see earlier posts), and really liked it. It might be hovering near that top 10 list, and who knows, might actually make it if I was forced to choose. Read Catcher in the Rye.. Rhye?... not sure how to spell that.. few years back. Interesting book, a classic, but not one I'd say was anywhere close to the best book I'd read. One of the more interesting, yes, but come on, classic or not, overall it really sucked as a novel. Anyway, not Water... a fairly recent book, won a lot of accolades, and deservedly so. Genre-wise, not in any, really, Contemporary Lit if I had to pigeonhole it. But really, really, really good. As Mr. Lee used to say, 'Nuff said. Now, as a lead in, let me say: I hope a lot of students across the world get to read this book Not just because it's so good, but because there is no movie made of it, not yet at least. You see, was talking to Amanda, and in earlier conversations with Audrey and Andrew as they attended, and always enjoyed, their English classes. Schools, not just theirs but everywhere, seem to think that when they teach a novel with a child, Farenheit 451, The Outsiders, what have you, and make the kids read them and discuss it, that the next logical step is to let them watch the movie. Read my earlier posts. I love watching movies. I also have some dear and fond memories of novels which I'd been, admittedly, forced to read in school and ended up loving. Two come to mind (though there were many): The Dispossessed by Ursela LeGuin, and Lord of the Flies, by William Goldman. Granted, Flies was made into at least one movie (2, I think). Never watched them, never will. I remember these novels vividly, every scene, every character, the smell of the fauna on the island with the students, the buzz of the bees, the smell of poor Piggy's blood on the rocks of the beach, the sound of the conch shell. I read this book at least twice for different classes. And now, 26 years later, I still remember it. These images are from a novel, not a movie. And that's a beutiful thing to a writer. For someone to carry with them memories of such an intimate sharing between author and reader for their entire life, is so special it can't be put into words. Yes, people eventually see movie versions of books - sometimes the movie is better (I think The Notebook movie was superior to the reading experience of the book, for me at least, and there seems to be an equal quality between the Harry Potter books and the films, to be honest about it), but not often (how many teenaged girls think the Twilight movies are not nearly as good as their beloved novels?). But when you're teaching children the love of the written word, you want to leave those precious memories, sparked by the author but brought to life by the children's own imaginations, alone. For a time at least. All three of my kids have read The Outsiders, another fond reading experience for me as well from middle school, and been able to relish in the memory of a good book for about a day or two, before the TV and DVD player was reeled in and they watched Hollywood's version. It then becomes the image they will remember. Years from now they'll say, "Yes, I read The Outsiders. I liked it. It was a good movie." Too bad. For me, I've read The Outsiders, and To Kill a Mockingbird, and loved them. Never saw the movies. And I'm glad for that. Because as long as I only have the memories of the books, Pony and Scout will always be, in part, uniquely mine.